The South Asian Association for Regional Cooperation (SAARC) comprises eight countries of South Asia, i.e. Afghanistan, Bangladesh, Bhutan, India, Maldives, Nepal, Pakistan, Sri Lanka. The idea of regional cooperation in South Asia was first mooted in May 1980 by Bangladesh President Ziaur Rahman. President Rahman addressed letters to the Heads of Government of the countries of South Asia, presenting his vision for the future of the region and the compelling arguments for regional cooperation in the context of evolving international realities. The Foreign Secretaries of seven countries in South Asia met for the first time in Colombo in April 1981 and identified five broad areas for regional cooperation. A series of meetings followed in Nepal (Kathmandu/November 1981), Pakistan (Islamabad/August, 1982), Bangladesh, India (Delhi/July 1983) to enhance regional cooperation. The next step of this process was the Foreign Ministers meeting in New Delhi in 1983 where they adopted the Declaration on South Asian Regional Cooperation (SARC). 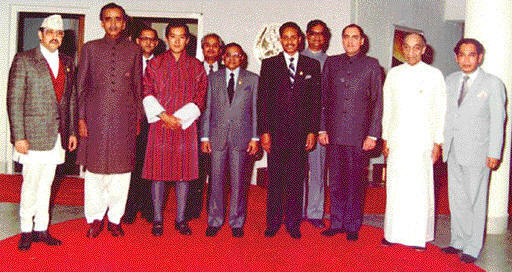 During the next two years South Asian nations committed themselves to form this South Asian alliance and the process culminated in the First SAARC Summit held on 7-8 December in 1985 in Dhaka where the Heads of State or Government of seven countries, Bangladesh, Bhutan, India, Maldives, Nepal, Pakistan and Sri Lanka adopted the Charter formally establishing the South Asian Association for Regional Cooperation (SAARC). The preamble to the SAARC Charter spells out the intention of forming this South Asian alliance as “We, the Heads of State or Government of BANGLADESH, BHUTAN, INDIA, MALDIVES, NEPAL, PAKISTAN and SRI LANKA; ‘Desirous of promoting peace, stability, amity and progress in the region through strict adherence to the principles of the UNITED NATIONS CHARTER and NON-ALIGNMENT, particularly respect for the principles of sovereign equality, territorial integrity, national independence, non-use of force and non-interference in the internal affairs of other States and peaceful settlement of all disputes’ ‘Conscious that in an increasingly interdependent world, the objectives of peace, freedom, social justice and economic prosperity are best achieved in the SOUTH ASIAN region by fostering mutual understanding, good neighbourly relations and meaningful cooperation among the Member States which are bound by ties of history and culture’ ‘Aware of the common problems, interests and aspirations of the peoples of SOUTH ASIA and the need for joint action and enhanced cooperation within their respective political and economic systems and cultural traditions’” ‘Convinced that regional cooperation among the countries of SOUTH ASIA is mutually beneficial, desirable and necessary for promoting the welfare and improving the quality of life of the peoples of the region; ‘Convinced further that economic, social and technical cooperation among the countries of SOUTH ASIA would contribute significantly to national and collective self-reliance; ‘Recognising that increased cooperation, contacts and exchanges among the countries of the region will contribute to the promotion of friendship and understanding among their peoples; Do hereby agree to establish an organisation to be known as SOUTH ASIAN ASSOCIATION FOR REGIONAL COOPERATION hereinafter referred to as the ASSOCIATION...’ Objectives Moreover, the cooperation of the SAARC is also based on broader principles of respect for the principles of sovereign equality, territorial integrity, political independence, noninterference in internal affairs of the Member States and on mutual benefit. Decisions are taken on the basis of unanimity and bilateral and contentious issues are excluded from the deliberations of SAARC. The highest authority of the Association rests with the Heads of State or Government. The SAARC Charter provides that the Heads of State or Government shall meet once a year or more often as and when considered necessary by the Member States. The country which hosts the summit holds the Chair of the Association. The Association also convenes meetings at Ministerial level on specialised themes Council of Ministers comprising the Foreign Ministers of Member States, the Council of Ministers is responsible for formulating policies, reviewing progress, deciding on new areas of cooperation, establishing additional mechanisms as deemed necessary, and deciding on other matters of general interest to the Association. The Standing Committee comprising the Foreign Secretaries of Member States is entrusted with the task of overall monitoring and coordination of programmes, approving of projects and programmes, and modalities of financing, determining inter-sectoral priorities, mobilising regional and external resources, and identifying new areas of cooperation. Usually this Committee meets twice a year preceding the Council of Ministers and submits its reports to the Council of Ministers. It may also meet in special session as and when necessary by agreement among Member States. The Standing Committee is authorised to set up Action Committees comprising Member States concerned with implementation of projects involving more than two but less than seven Member States. (Article VII of the SAARC Charter). The Programming Committee (which is not a SAARC Charter body) comprises senior officials of member States. It assists the Standing Committee in scrutinising the Secretariat Budget, considers the reports of the Technical Committees, SAARC Audio Visual Exchange (SAVE) Committee, and Regional Centres finalising, and the Calendar of Activities. 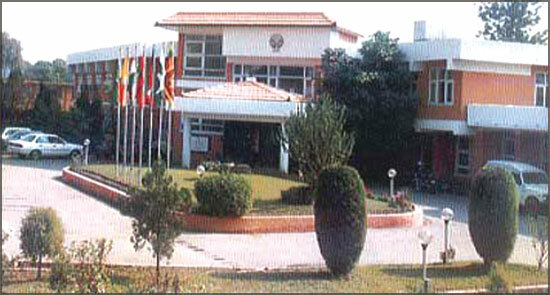 The SAARC Technical Committees are responsible for determination of the potential and the scope of regional cooperation in agreed areas, formulation of programmes and preparation of projects, determination of financial implications of sectoral programmes, formulation of recommendations regarding apportionment of costs, implementation and coordination of sectoral programmes, and monitoring of progress in implementation. In addition to the Technical Committees, various Working Groups are established to consider specific issues and make recommendations to the appropriate SAARC bodies. Currently five Working Groups are established in the areas of Telecommunications and ICT, Biotechnology, Intellectual Property Rights and tourism. SAARC Secretariat The SAARC Secretariat is based in Kathmandu, Nepal. The Secretariat coordinates and monitors implementation of activities, prepares and services meetings, and serves as a channel of communication between the Association and its Member States as well as other regional organizations. The Secretariat is headed by the Secretary General, who is appointed by the Council of Ministers from member countries in alphabetical order for a three-year term. Dr. Sheel Kanta Sharma from India currently serves as the Secretary General of SAARC. The Secretary General is assisted by Directors on deputation from Member States. Committee on Economic Cooperation The Committee of Economic Cooperation consists of Secretaries of Commerce of member states and it promotes regional cooperation in the economic field. The Agreement on SAARC Preferential Trading Arrangement (SAPTA) was signed in Dhaka during the 7th SAARC Summit, in 1993. It aims to promote and sustain mutual trade and the economic cooperation among the South Asian States, through exchanging concessions. Later, with the broad objective of moving towards a South Asian Economic Union (SAEU), the SAARC Member States signed the Agreement on SAARC Free Trade Area (SAFTA) on 6 January 2004 at the 12th SAARC Summit held in Islamabad and came into force on 1 January 2006. SAFTA has six core elements covering trade liberalization programme, rules of origin, institutional arrangements, safeguard measures, special and differential treatment for least developed countries (LDCs), and dispute settlement mechanisms. The signing of the Social Charter by the Heads of State/ Government at the 12th SAARC Summit held in Islamabad in 2004, has been a major development in SAARC. The Social Charter aims at promoting the welfare of the peoples of South Asia and accelerating economic growth and social progress through poverty alleviation, improving health conditions of peoples, human resource development, empowerment of women, and providing welfare to the children. Although the Social Charter is not a binding document, it underpins the SAARC Charter objective of ‘providing all individuals the opportunity to live in dignity and to realize their full potentials’. SAARC Regional Convention of Suppression of Terrorism The SAARC Regional Convention of Suppression of Terrorism was signed during the Third SAARC Summit in Kathmandu in November 1987. This was the result of a series of discussions held between Member States for more than two years starting from very first SAARC Summit held in Dhaka. This Convention recognizes dangers posed by the spread of terrorism and its harmful effects on peace & cooperation and also the sovereignty and territorial integrity of the States. This Convention came into force on 22 August 1988. Later, an Additional Protocol to this Convention was signed during the 12th SAARC Summit in Islamabad on 06 January 2004. This Additional Protocol updates the Convention by adding terrorist financing and has been ratified by all Member States. SAARC Regional Agenda The Agenda of Regional Cooperation under SAARC has expanded over the years and are broadly covered under the Regional Integrated Programme of Action (RIPA). In addition, a number of issues are given high priority. At the 12th SAARC Summit held in Islamabad in 2004, the Heads of States/Government recognized ‘poverty alleviation’ as the greatest challenge facing the peoples of South Asia and declared poverty alleviation as the overarching goal of all SAARC activities. Co-operation with the International Organizations SAARC has established institutionalized arrangements for cooperation with a number of other regional groupings and international and regional organizations. It has entered into cooperative arrangements through the signing of MOUs with organizations like the EC, UNCTAD, ESCAP, UNIFEM, APT, ITU, UNDP, UNDCP, UNEP, UNIFEM, CIDA, WHO, ADB, PTB, UNAIDS, UNICEF, World Bank etc. SAARC has recently agreed with ASEAN Secretariat for a Partnership Work Plan (2004-2005) in a number of areas including trade, HIV/AIDS, energy and tourism. SAARC has a dialogue forum with ASEAN and EU on the sidelines of the UN General Assembly sessions. Under the SAARC Visa Exemption Scheme, some specifically identified categories of persons along with their spouses and dependent children are entitled to travel within the SAARC region without visa. Although the Visa Scheme is yet to attain the depth and coverage of regional visa schemes like the Schengen visa, it has proved to be effective in generating credibility about the SAARC process. SAARC as an institution has always emphasized the need for strengthening people-to-people contacts through greater participation of NGOs, including professional bodies in the private sector, to promote socio-economic and cultural co-operation in South Asia. SAARC has formulated a set of guidelines and procedures for granting recognition to regional NGOs and professional bodies. SAARC Charter Day The SAARC Secretariat and Member States observe 8th December as the SAARC Charter Day. SAARC designated years SAARC has designated years to draw special focus on specific social issues and has contributed to raising awareness, mobilizing resources and adopting/adapting national programs.